Still priced high. India inflation, 2014-2017. 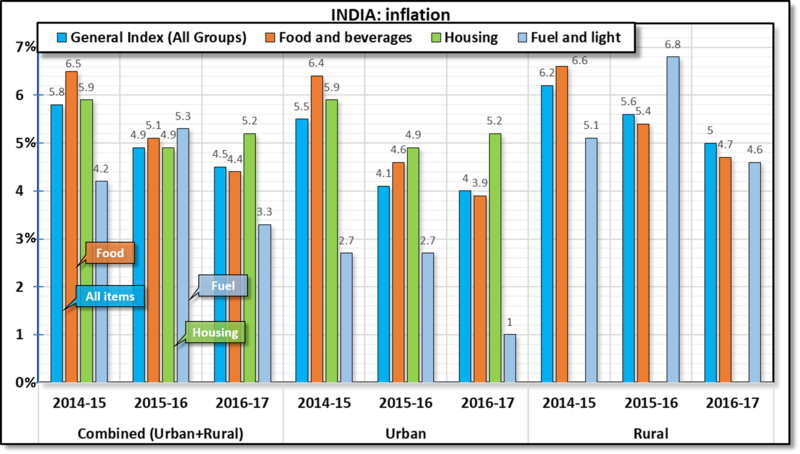 The 2017 annual report by the Reserve Bank of India shows inflation is slowly coming down, currently at about 4.5% for the country as whole. This is more than a percent point reduction from two years ago. The inflation in food & beverages is much higher than other items, which would make sense for a developing country where a large portion of the income goes in buying basic items. Despite a perception of gloomy housing market, prices are still rising by more than 5%. The tumble in global oil prices has kept the fuel prices under control, and mass electrification in recent years has helped. The prices paid by rural consumers are in general higher than urban areas. That’s not only true for food but fuel as well. In fact, rural fuel prices are rising four times faster than cities–which are extremely polluted and almost unlivable. This is indeed a shame. It shows the gains enjoyed by market & infrastructure inefficiencies are still not reaching the rural households which comprise almost two-third of the population. The Modi government has kept the pace of infrastructure development but the gains are slow to show up. Source: Reserve Bank of India annual report 2016-17 (page 217).